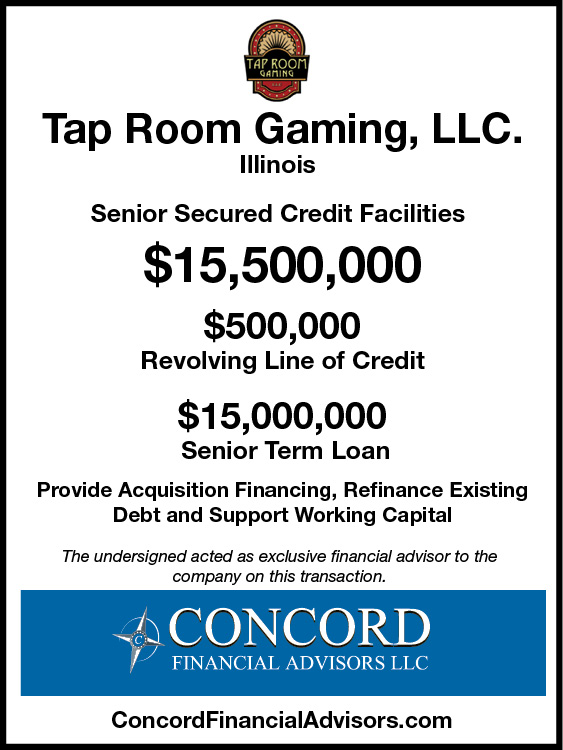 Concord Financial Advisors, LLC announces the closing of $15,000,000 of Senior Secured Credit Facilities for Tap Room Gaming, LLC (TRG), a leading provider of video gaming and amusement services in Illinois. TRG, founded in 2012, sought acquisition financing to complete the purchase of a strategic key competitor. Concord provided value added services by successfully completing a search for debt financing. Concord quickly assessed that TRG’s core business was strong, as was their management team, and hence would be an attractive client for several leading financial institutions. Concord worked with TRG to prepare and present an offering memorandum featuring TRGs strong management team, competitive strengths in the IL market and, furthermore, highlighting the synergies of the proposed acquisition. After conducting a targeted search process to a variety of prospective debt capital providers, Concord secured a financing proposal that allowed TRG to complete the transaction and provide an avenue for growth capital should other similar opportunities arise.